If you remember the handle “Samo(c),” then like me, you hung out in the East Village in the ’70s where Jean-Michel Basquiat was doing his graffiti-style thing. You can visually stroll the streets of “the village” at the Jacob Burns Film Center in May through “FrameWorks 2019: Art on Film,” a curated series of films about artists and their works. It’s an exciting romp through some of the edgier arts lore, including the heist of an Auguste Rodin bronze sculpture from a museum in Chile and the murder of a Barnett Newman painting. 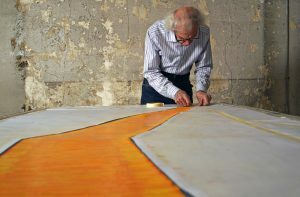 If that doesn’t put you on the edge of your seat, try Walking on Water, a documentary in which Christo has folks – yes, you guessed it – walking on water. There’s an introspective look into the artistic vision of the octogenarian Yayoi Kusama and some insight into the young Picasso. After the film on Barbara Rubin, there is a Q&A with Ara Osterweil, a film scholar, painter, and former member of JBFC faculty who has done extensive research on Rubin, and other underground figures such as Andy Warhol, Carolee Schneemann and Yoko Ono. And BTW, if you are a Friend of ArtsWestchester, (just saying), you can join a group of like-minded individuals for a tour of the nearly seventy works by Basquiat at the Brant Foundation in NYC (For information: call ArtsWestchester’s Development Associate Olivia Greco at (914) 428- 4220 Ext. 328). True. You could stay home and watch PBS, but you’d miss the popcorn. After the movies, check out some of my favorite eateries in Pleasantville such as Pub Street, Mediterraneo and Falafel Taco.